The world is getting more and more competitive by every passing day, people struggle hard to get to their desired set of goals. This journey of achieving the goals in life carries on throughout the life of the human because with the changing time the goals of an individual also changes. A life of an average person is particularly set into different segments, which he needs to pass on to gain success in his life style. These segments can be such as schooling, getting a degree or making yourself expert in your interest, finding a job, getting selected, earn for living, setting up family, responsibilities, etc. The most crucial and the most challenging part of the life is the time when you need to prove your skills, education, capabilities, character, knowledge and spark. This point is actually the Interview where your whole career and future lifestyle depends. A majority of the people takes this as a normal procedure of life and face rejections from best opportunities in life, but there is also another type of peoples who understand the true value of life and devote themselves in development of their personality so that they do not face any sought of rejection at any point of time throughout their lifespan. The preparation of the interview does not start days before the interview, but it starts from your growing age of childhood. This is because of the things and the qualities that we develop in ourselves over the years can’t be changed in a couple of days. The way you are presenting yourself is the very first impression in the employers mind about your character. The presentation of an individual should be in according to the interview, there is an old saying that “The first impression is the last impression” fits perfectly in this situation. The better you present yourself in the interview in front of the employer the more your chances will increase of getting successfully selected in the company. When we talk about education most of the people think only about the studying knowledge that they have achieved in their education life, but practically the meaning of the education here is quiet deep. Here education means your attitude, etiquettes, sense of mind, vision of seeing the things, manners, respect, politeness and your character along with the knowledge that you have gained from your studies. When you have all the qualities in the right quantity then you will definitely make a strong and bold impression in the mind of the employer. Most of the times people master over their internal characteristics but in mastering over these characteristics they tend to forget one most important thing i.e. the outlook and the physique of his body. The physique of the individual should be perfect in all manners; perfect doesn’t means to have a gym body but it means to have an ideal body which is much capable of doing all the given work in the give time limit without getting into the situation fatigue. Moreover your energy level should be good enough at least while giving the interview as this assures that you are active and energetic during the working time. When you are giving the interview just for the sake of job then the employer catches this point and sees no interest and need in your eyes then he will likely lose his interest in taking your interview. A person should have a great urge of work; this shows your willingness to do the job and leaves a positive impression to the employer. When you go for the interview you need to do some revision on your skills and capabilities more over knowing your potentials is one such thing that will help you to be confident about yourself throughout the interview. These skills help the employer to understand your potentials and decide in which post do your skills fits the best. But certainly there are still some peoples who overlook all the aspects of preparation for the interview and then they get embarrassed in front of the employer. This situation mostly occurs when the person hears the awkward questions and statements from the employer, which directly or indirectly gives the person an indication of his rejection from the interview. So let us see some of the most common statements that are used by the employers that you will not like to hear during your own interview. This is one of the most embarrassing situations when a person is caught red handed, this happens when you have mentioned false information about your last work experience in your CV and accidently the employer verifies it over the phone and comes to know the truth. So you should not mention the false information and more over if in case you are fresher then also you need not to put any false experience which would create problems during the interview. Most of us tend to be active on our face book accounts but some of us become more than active and tend to post every live update of their life in public which contains partying moments, outdoor visits, trips, personal stuff, friends, etc. this would become a problem if there is something suspicious in your account, the employer will straight away notice it and overlook your present state of well being and start setting up an image of yours based on the suspicious information. So you can at least improve your accounts privacy which will keep intruders and unknown persons away from your personal accounts. When we are overlooked because of our less experience in the market or the industry then this statement comes out or when the expectation of the company and the organization is way more than your prediction then you can’t help it. This becomes very embarrassing and works as it works as a deal breaker during your interview. If you have entered the interview room and then the employer finds something stick upon your shirt, or bad smell or something which is stuck in between your teethes, then it gives a very negative impact in the employers mind and he thinks of removing you even form the list. So the best solution is that, go to the restroom just 5-10 minutes before the interview and check our presentation thoroughly so that when you enter the interview then your personality doesn’t leaves the space for the questions. If the employer says this statement to you then most of the time it is because of something negative or wrong that the employer has seen in your personality. 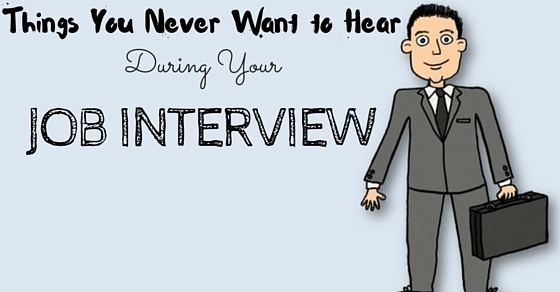 Moreover chances are rare of any further proceeding with the interview as the employer will himself ask you to leave. To avoid this situation you need to be positive at all time when you are facing the interview. If you had made plenty of spelling and grammatical mistakes in your CV then chances of you getting selected finishes at the point your resume is read by the employer, moreover these mistakes shows many negative points in your personality, so the employer will hardly select you for the job. Remember that before sending or submitting your resume to any company or person you need to check your CV at least 2 times so that every mistake that you have made in the spelling and the grammar can be corrected. It is obvious that no one will actually take a pet along him for the interview, but there are some people who do not understand this rule and yet take their pets along with them while going for the interview. One should only take his pets or any animal with him if he is going for the post related to any veterinary field and if not then it is suggested to leave your pet back at your home. This statement can come due to many reasons, but we all are well aware of the fact that the interview is the game of numbers and the employer has to select the best out of many, so if you hear this statement then your changes are challenged by others and only the best man is selected at the end. But practically if you were the best from all then you would not have heard that statement from the employer. Moreover if your interview was good you will definitely get to hear some positive appreciations which will directly indicate towards your successful selection in the interview. This one is really a tough one to face and answer, this is asked generally when the interviewer thinks that your capabilities does not fit well for the post that you have applied for. At this point of time you just need to be calm and answer this question by setting some of the working examples from your past job experience, in case you are a fresher in the industry then you need to speak a bit more about your potentials so that the employer gets a clear vision of your capabilities and then judges your performance in the interview. This is a very crucial mistake that no one should make because if you are not sure of your hiring employers name then chances of getting further selected becomes null and you may get a bad rejection form the company. To avoid this situation to need to do some homework just before the interview and especially you need to be clear about the name of the person who is going to take your interview. This generally means that you will never get to hear from us that you are selected. This is a general method of ending the interview without letting you down. If in case the company says that then the employer will give you specification about the timings and the venue of next follow up. So if your employer comes up with this question then you need not to be afraid of asking that; are you going to inform both the selected and unselected candidates. Or till when I can expect a call from your end? The general translation of this statement is “what can you do for me to get this job”. This is a very cheap and illegal statement that any employer throws at you seeing your condition and desperation to get a job. Moreover this is a very insulting way because many a times this statement directly means that the employer needs to have sexual pleasures in order to select you for the desired post that you have applied for. So if you feel like you are been insulted or demanded by any sexual pleasure then you need to immediately file a case and report to the nearest police station. So, we have seen some of the unwanted but common statements that no one will like to hear during the interview. If you need to get selected then you need to do your home work well and preparation best.